^ Björk. Swedish Royal Academy of Music. [2011-01-04]. ^ Festival de Cannes: Dancer in the Dark. festival-cannes.com. [2009-10-11]. ^ The Greatest | Show Cast, Episodes, Guides, Trailers, Web Exclusives, Previews. VH1.com. Retrieved 2013-10-08. ^ MTV 22 Greatest Voices. MTV. 8 March 2005 [1 January 2012]. ^ Martin, Chris. 100 Greatest singers list. Rolling Stone. [December 30, 2012]. ^ Selective justice at Kárahnúkar says Björk's father. Iceland Review. 2005-03-08 [2010-01-26]. ^ Michel Gondry. Filmbug. [2012-03-15]. （原始内容存档于2012-03-14）. ^ 11.0 11.1 11.2 RIAA Searchable Database. RIAA. [23 December 2011]. Note: reader must define search parameter as "Bjork". ^ The Brit Awards. everyHit.com. Retrieved 2011-02-28. ^ SPIN Magazine's Top 90 albums of the 90's. Spin. [23 December 2011]. ^ 125 Best Albums of the Past 25 Years. Spin. 30 November 2010 [23 December 2011]. ^ Staff Lists: Top 100 Albums of the 1990s. Pitchfork Media. 17 November 2003 [23 December 2011]. 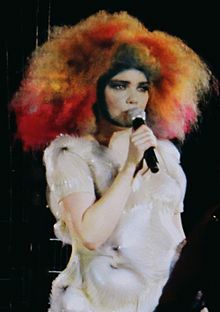 ^ 500 Greatest Albums: Post - Bjork. Rolling Stone. [23 December 2011]. ^ Radiohead Testcast: Entanglement (pt 2 – Bjork's Unravel). YouTube (2007-11-08). Retrieved 2011-02-28. ^ Björk : book, A project by Björk 互联网档案馆的存檔，存档日期2006-10-28. Official Bjork website. Retrieved 23 December 2011. ^ Bjork Gets Orchestric: Bjork. Rolling Stone. [6 August 2001]. （原始内容存档于2008年1月6日）. 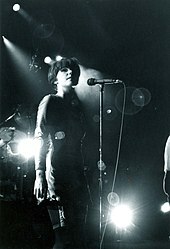 ^ Q Magazine, February 2002, Q Concert Review, "Björk – Haskolaboi, Reykjavik", by Nick Duerden. ^ NSFW! – It's The 18 Most Explicit Music Videos Ever. Nme.Com. Retrieved 2011-02-28.